NEW T-SHIRT: Dredd vs Death! Stak! Order your classic Rogue Trooper T-shirt now! Bred for war, a legend forged in the poisoned wastelands of Nu Earth - he is the Rogue Trooper ... and you can now get one of the all-time greatest comic covers on a quality T-shirt! Whether you're a Nort or a Souther, you'll want to wear Dave Gibbons' stunning cover from 2000 AD Prog 228 on the shirt of your choice - the cover that introduced readers to one of 2000 AD's most popular characters! Created by Gerry Finley-Day and Gibbons, Rogue Trooper is the blue-skinned soldier fighting his own war amidst the choking chem clouds of this tainted planet, trapped between two opposing and intractable armies, his only company the digital personalities of his three dead comrades - Bagman, Gunnar, Helm - encoded into his equipment. Order now - Strontium Dog miniatures starter pack! Order the starter pack for the Warlord Games miniatures game based on John Wagner and Carlos Ezquerra's Strontium Dog! Now available to order from the 2000 AD webshop - the Strontium Dog Starter Pack from Warlord Games! This fast-paced tabletop miniatures game allows two or more players to fight out scenes from the Strontium Dog universe created by legendary comic creators John Wagner and Carlos Ezquerra. Containing all the game rules, a scenario booklet to help you learn the game and refight the S/D Agents’ showdown with their mutant foes, as well as superbly detailed miniatures to fight over the solar farm scenery, this is a great way to get started with your Strontium Dog games! DEATH TO THE FLESHY ONES! Get the Heavy Metal Kids T-shirt! Originally a feature of the Robot of the Year Show in 2099, the 30-feet-tall Heavy Metal Kids came equipped with a wrecking ball and claw, and were virtually indestructible! When Call-Me-Kenneth's robot rebellion began, a group of HMKs broke out and, after killing several Judges, were only defeated when Dredd tricked them into smashing the road beneath their feet, sending them falling a mile down to their doom! Order this iconic Judge Dredd T-shirt now! Keep perps at bay with the ultimate in law enforcement apparel! CRIME IS THE QUESTION – HE IS THE ANSWER! Keep perps at bay with the ultimate in law enforcement apparel! This brand new T-shirt bearing Mick McMahon’s iconic art from the cover of 2000 AD Prog 168 (July, 1980) features the lawman of the future, Judge Dredd, and is available to order now! This stunning piece of Judge Dredd merchandise featuring classic artwork is available to order now in multiple sizes and colours. Printed in the UK, this quality T-shirt is mandatory wear for any Dredd fan! McMahon is one of the defining artists on the 1980s heyday of Judge Dredd, his constantly evolving style inspiring generations of readers with its seemingly effortless depth and inventiveness. The cover to Prog 168 perfectly sums up his vision of Judge Dredd – lithe, taciturn, no-nonsense. A perfect slice of 1980s nostalgia and enduring design, all rolled into one! Available in both unisex and women’s cuts on Fruit of Loom shirts. Planet Replicas has unveiled its new range of licensed pin badges featuring designs from two of 2000 AD's biggest strips - Judge Dredd and Rogue Trooper! Included in every Search Destroy Agents enrolment pack, this classic Strontium Dog logo from the pages of 2000 AD makes for a simple yet perfect keychain (or backpack) addition! Continue your Rogue Trooper collection with these classic pin badges - a gift-boxed set including Major Magnam Biochip, Nort Logo, and Souther Logo! All metal with weathered and enamel details. And, finally, the Judge pin-badge set, featuring a Dredd badge inspired by the work of Carlos Ezquerra, a Psi Judge badge, a Luna-1 Judge badge, and a Sov Judge badge! These mini versions of the classic Judge badges are all metal and a perfect addition to our existing sets- making a great present for any 2000 AD fan! Order the 'Bagman' Rogue Trooper backpack now! Planet Replicas presents the legendary 'Bagman', Rogue Trooper's essential kit bag - 500 units worldwide only! GI's get ready, this fully functional replica bag is a perfect cabin bag size, and with its 6 zippered compartments, it's ready to store all your mission supplies! The 600d Polyester outer features four external pouches- including two detachable lens pod pouches- custom zip pulls with the GI logo, mesh padded shoulder straps and a carry handle. The fully lined inner comes with elasticated hold-down straps to secure your goods, and the main bag's flap is also compartmented using a zip opening heavy duty clear vinyl, perfect for Milli-com documents. This unique piece of classic Rogue Trooper merchandise is limited to just 500 units world wide so, much like the GI's, it'll be wiped out from stock very quickly - order yours today -you don't want to miss out! Osprey Games has announced that Judge Dredd illustrators Rufus Dayglo and Dan Cornwell are working on the Judge Dredd: The Cursed Earth card game, providing specially commissioned, full-colour artwork for the game. Judge Dredd: The Cursed Earth is an immersive sci-fi western based on The Lost Expedition, the best-selling card game by Peer Sylvester. Players must lead a team of Judges against dinosaurs, mutants, and the Cursed Earth itself to hunt down a dangerous fugitive, before a gang of criminals can get their hands on him. As they scour the wastelands, the team will encounter a host of threats that will push their resources and abilities to their limits. Rufus is a self-confessed 2000 AD superfan, and made his Judge Dredd debut in 1998. 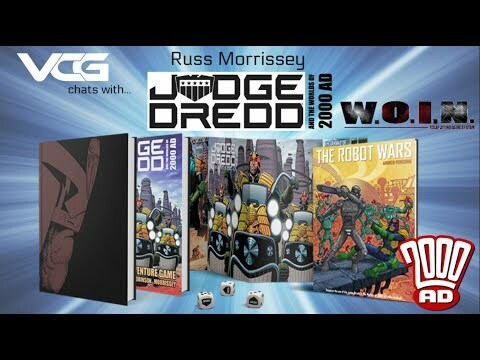 Since then he has worked extensively with 2000 AD and the Judge Dredd Megazine, with his art also featured in publications by Image Comics, IDW Comics, DC Vertigo, and more. Rufus is providing artwork for the cover, as well as for the character and adventure cards. Dan has been working on Judge Dredd since he made his 2000 AD debut in 2017, having impressed with his work on Rok of the Reds. His other work includes titles such as Futurequake, Dogbreath, and 100% Biodegradable. Dan is providing artwork for the character, adventure, and landscape cards. Duncan Molloy, Games Developer at Osprey Games, commented, "Rufus and Dan have been a joy to work with, bringing that classic Dredd feel to the game. I think fans of Dredd’s world will love what they’ve done with the place." 2000 AD and Rebellion are pleased to announce a new license with Q-Collectibles for a statue based on the iconic Judge Dredd. The first statue in the license will be in true 1:4 scale comic edition with some alternative display options. Sculpted by the talented Eduardo Silva from Brazil, this limited edition will be available worldwide. Based in Switzerland with a production base in China, Q-Collectibles is a new producer of high-quality statues that works with sculptors from around the world. Co-created by writer John Wagner and artist Carlos Ezquerra, Judge Joseph Dredd first appeared in the second issue of weekly anthology comic 2000 AD in 1977. Judge Dredd is a law enforcement officer in the dystopian future city of Mega-City One, which covers most of the east coast of North America. He is a street judge, empowered to summarily arrest, convict, sentence, and execute criminals. Above all else – he is the law! Judge Dredd is the most famous of the Judges that patrol Mega-City One, empowered to instantly convict, sentence, and even execute offenders. Dredd is armed with a "Lawgiver", a pistol programmed to recognise only his palm-print and capable of firing six types of ammunition, a daystick, a boot knife and stun or gas grenades. His helmet obscures his face, except for his mouth and jaw. He rides a large "Lawmaster" motorcycle equipped with machine-guns, a powerful laser cannon, and full artificial intelligence capable of responding to orders from the Judge and operating itself. Q-COLLECTIBLES - created by collectors for collectors. Producing licensed collectibles and aiming for perfection. Here at Q-Collectibles we love art - we work together with some of the most creative designers, sculptors and doing our best to bring out high quality collectibles to our fans. Early concept shown - not final. Watch the new Judge Dredd: Block War card game trailer! 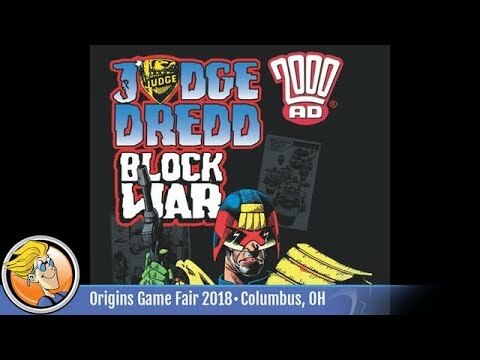 The new Judge Dredd: Block War card game from Game And A Curry Games is coming in 2018 - and you can check out the first trailer below! 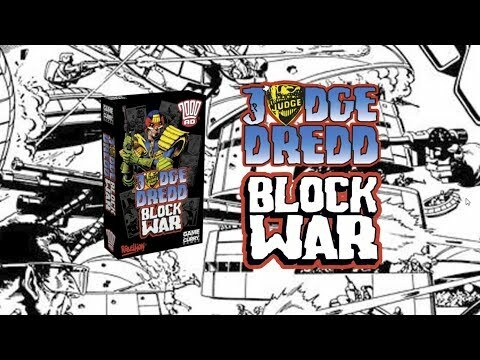 BLOCK WAR is a two-player card game based on one of the greatest story arcs in Judge Dredd history. Each player controls five windows on their side of the street. Place your gangs and open your windows to attack and close them to defend yourself. Down on “The Street” the Justice Department has responded to the disturbance and have joined the battle. Not only are you attacking your opponent, you are attacking the Justice Department that is sworn to stop you. Strategically open/close your windows to defend yourself from the never ending onslaught that is facing you. But Watch Out! They’ve called in a Manta Tank! One shot destroys your window, and if you’re really unlucky, you’ll face Judge Dredd Himself. The Judge Dredd: Block War card game was specifically designed to be as brutal a game to play as it is to exist in Mega-City One!